NETGEAR genie App is an easy, way to manage, monitor and repair your home network--from the palm of your hand. While on your home network NETGEAR genie app allows you anywhere-in-the-house access to all the cool features on your router without having to boot up your computer: Wireless Settings, Network Map, Live Parental Controls, Guest Access, Traffic Metering, My Media, and more. 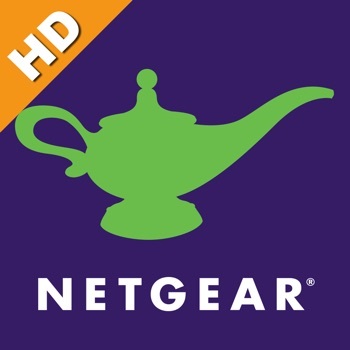 All you need is your tablet or smartphone and NETGEAR genie App. • Easily control your home network through the genie dashboard • Stream Media—find and play music and video files anywhere in your network from your smartphone/tablet • Print from your iPad® or iPhone®--Windows or Mac genie makes any printer AirPrint® compatible • Securely connect smartphones and tablets to your home wireless network with the scan of a QR code thanks to EZ Mobile Connect *** IMPORTANT NOTES *** For any issue, please contact netgeargenie@netgear.com. genie does not work when connected to the guest network. If enabling "Wireless Isolation", Genie won't log in from wireless devices. genie may not work if the router is running access point mode with fixed IP. genie does not work with wireless extender. genie currently does not support IPv6. iOS version supported: iOS 7, iOS 8, iOS 9 General Information: List of WiFi Routers that support genie: » R8000 » R7500 » R7000 » R6300 » R6250 » R6200 » R6100 » Centria (WNDR4700, WND4720) » WNDR4500 » WNDR4300 » WNDR4000 » WNDR3800 » WNDR3700v3 » WNDR3400v2 » WNR3500Lv2 » WNR2200 » WNR2000v3 » WNR1500 » WNR1000v2 » WNR1000v3 » WNDRMAC » WNR612v2 DSL Modem Gateway: » D6300 » DGND4000 » DGND3700v2 » DGN2200v3 » DGN1000 My Media: My Media uses the default media player on an iOS device to play media files if the iOS device is being used as a player. Supported media formats are: • Supported audio formats: AAC, HE-AAC, MP3, Apple Lossless, AIFF and WAV. • Supported video formats: H.264, MPEG-4, and M-JPEG. • Supported photo formats: JPG, TIFF, GIF, PNG, and BMP. Notes for My Media: 1) Each supported media format has limitations in media encoding parameters, such as bitrate, frame rate, and resolution. When My Media is unable to play media files with the supported formats, it may be because the files have higher bitrates or frame rates that exceed the rate it can support. 2) The devices listed in Player view will be Genie device and other devices available in the network. If you select another device to play media files, you may encounter some of the following behaviors, which are not the bugs: • NETGEAR Genie needs to be running in the My Media function to show up as a player or source. • Some media files can be played in some players, but can’t be played in other players. Different players support different kinds of media file formats. • Genie can show photos and videos in Source view if you grant Genie permission to access the location service. Genie can’t play music from the iOS device due to copyright restriction. • Use the File Sharing feature to transfer media files from your computer to Genie. After Genie is installed and the iOS device is connected to iTunes, go to the Apps tab. The File Sharing section is at the bottom of the page. Select Genie in Apps, then drag and drop the media files to the Genie Document list box. • If My Media can’t find any source or any player, it may be because your device is disconnected from the NETGEAR router. • After any change in the network, including Wi-Fi setting, source folder change, and list of player change, you will need to restart the media service and refresh the source folder in the Option view. • It sometimes takes a long time to access and play a media file. This may be caused by a slow network, large file size, or heavy load in the player or source device.